What is the relationship between memory and emotions? The study of emotion is remarkably broad in its scope for anthropological concern, and the numerous influencing factors involved in it are invariably diverse. One factor that must not be underestimated is that of memory. It can be said that the two are interrelated through the influencing effect each has on the other, as will be expanded upon throughout this essay, as I dissect what I recognise as the most important elements of this memory-emotion connection. First, is the notion of “collective memory”, and the influence of individual perception and identity within it. 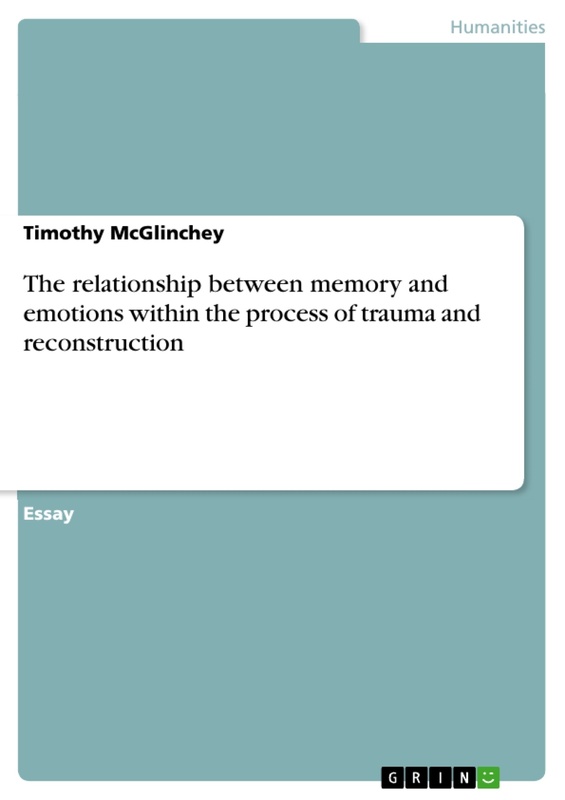 Also, I wish to examine the role of memory and emotion in the processes of trauma and reconstruction. In order to bring context to each of these areas, I will relate them to two main ethnographic case studies. The first is that of the maltreatment of Sudeten Germans and their displacement from Czechoslovakia, as researched by Svašek (2005). The second is a study by James (1997) who investigated fear in a transit camp for Sudanese asylum-seekers in South-West Ethiopia. Whilst focusing primarily on these, I will also make reference to Hinan’s study of collective memory and reconciliation in Guatemala and Rwanda (2010). Throughout this essay, with reference to these studies and other relevant research, I intend to clearly outline the significant relationship between memory and emotions. The first area I wish focus on is that of collective memory, which too lends itself to the notions of identity and individual perception. The link between these concepts is clearly demonstrated by Hinan, who says “memory shapes identity, memory establishes a collective narrative, and within that narrative, memory ascertains truth” (2010:20). To understand this statement fully, I wish to relate it to my first ethnographic case study of the Sudeten German expellees. During World War Two, most Sudeten Germans living in Czechoslovakia supported Hitler and the Nazi regime, which contributed strongly to already existing anti-German attitudes from the Czechs. At the end of the war, the Czech government ensured that the Sudeten Germans lost their citizenship and property, and so were expelled to Germany and Austria. However, during this time, many were killed by those who saw them as guilty of Nazi crimes. Svašek's research focuses on the traumatising consequences that arose through the displacement and violence towards them, and the emotional significance of their memories from this time. The effects of these events on the lives of the Sudeten Germans still persist today, as their identity has, to an extent, become shaped by their memories of their experiences. This link between memory and identity is a prevalent and reoccurring theme within this topic, and its significance is boldly described by Boyarin who claims that “identity and memory are virtually the same thing” (1994:23). The point Boyarin makes here is that the development of our identities is so dependent on the memories that shape it, the two could almost be seen as synonymous. In more recent times, several organisations have been established which seek to recognise and appreciate the loss and oppression that the Sudeten expellees endured. It is through these, in part, that Svašek suggests an element of collective memory is established; “in some of these organizations, 'shared victimhood' forms the main raison d'etre”. Svašek explains that this process of “shared victimhood” is linked to a concept known as “chosen trauma”, coined by psychiatrist Vamik Volkan (1999) who sought to analyse the intergenerational transmission of trauma. Volkan argued that it is “more than a simple recollection; it is a shared mental representation of the event, which includes realistic information, fantasized expectations, intense feelings and defences against unacceptable thoughts” (1999:46). Moreover, it refers to a shared, adopted mind-set that acts as identification of a group, founded upon a traumatic event. The group does not choose to be traumatised, but they choose to install significance upon the incident; “what becomes important is the fact that the group carries the mental representation of the traumatic event” (Volkan, Berlin Meeting, 2004), the actual reality of the event loses importance. This concept is rooted in the emotional association applied to memories, but also the individual perception of memory, suggested through the term “fantasized expectations” (1999:46). However, in recognising the individuality of memory, the reality of truth must too be questioned. As Hinan asserted, it is the formation of identity (from memory), and the consequent collective narrative that then leads to the truth. In recognising this subjectivity of “truth”, Hamber and Wilson make the point that memory creates its own truth that may not be as accurate as historical truth (2002). Although, in a purely technical sense this may be true, Nora's understanding of truth is that it is in fact more “truthful” than history, as it is the “truth of personal experience and individual memory” (2002:6). It is therefore the “truth”, as exclusively understood by the expellees, as well as their shared victimhood or “chosen trauma”, that forms their collective memory. Another facet of this chosen trauma to which emotion is directly linked, is the “intergenerational transmission” that Volkan addresses. In the case of the Sudeten Germans, Svašek refers to “intergenerational projections of loss” (2005:203) as a way of explaining how it is not only the victims of terror who have been traumatised by the events after the war. Svašek demonstrates, specifically through the use of a poem written by an expellee, how attempts were made to “emotionally engage the next generation” (2005:204), not necessarily through the continuation of traumatic suffering, but instead through installing identity within the politics of shared victimhood. It was through a variety of mediums such as photographs, testimonies, shared belongings and others that this was achieved. This apparent intergenerational emotional inclusion is also addressed by Crumley when she says, “individuals pass on their behaviours and attitudes to others in various contexts but especially through emotional and practical ties and in relationships among generations” (2002:40). This once again reifies that importance of a memory-emotion interaction in the formation of collective, and indeed intergenerational, memory. In many ways, this case study of the Sudeten expellees can be likened to Hinan's comparative study of collective memory in Guatemala and Rwanda. Racism, Memory and Trauma in Canada and the "Soucouyant"